You would think that with all the phones in the market and the sudden boom in technology applied to smartphones people with disabilities should be covered and have solutions at their disposal, like say for example people visually impaired. But apparently there aren’t enough, no more than increasing the contrast or having the phone speak to you through every single step or area you navigate on your phone. But this is about to change thanks to British company OwnFone and their 3D printed phone for the visually impaired. How does this work? Well, it’s pretty straight forward and we are surprised how this didn’t come out sooner since 3D printing has been around for quite a while now. Users can submit their needs via OwnFone’s website arranging the cool looking phone with specific buttons, the buttons have the Braille system printed in them, so user can request specific actions from each button like care takers number, emergency services or family members, even have a dial pad printed in case they have memorized all of their contacts. But that’s not just it, the company can also 3D print textures and symbols to help users navigate through simple to use menus giving them a more complete experience, like when you use your smartphone. 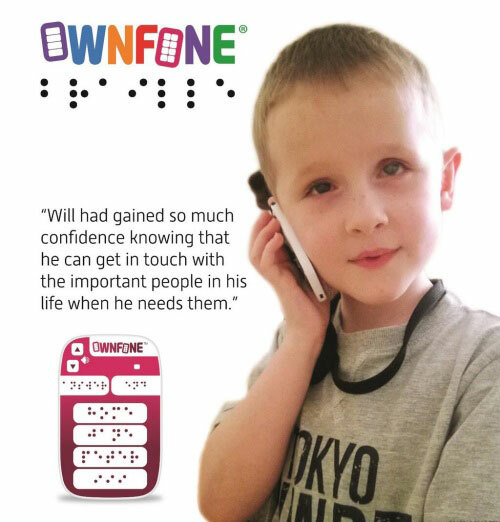 OwnFone has been around for a while, their first 3D printed product was a phone aimed to four to nine year olds, look in the break for a video of this product being used. Why 3D printed? Well due to the small market size a full manufacturing process can’t be costed and expect to have some sort of profit so 3D printing provides an easy, fast, quality and affordable process to bringing this products to the market at affordable prices, the OwnFone with braille system is hitting the UK market at a price of 60pounds. He also mentioned that they are on the works for launching a kick-starter campaign in order to bring OwnFone products to international markets. Can We Create 3D Printed Organs That Produce Electricity? Can This Project Turn to be the Future 3D Printed Car?